Sometimes textmode is where it's at. I've long blogged about tools and techniques that will make your Windows console experience better. Perhaps you're a *nix person who is using Windows in your day job, or you wish the Windows PowerShell prompt was more nix-y. Or perhaps you're a PowerShell person who wants to take your command-line to the next level. Well, just as NuGet is how we get .NET libraries quickly, and Chocolately is a kind of apt-get for Windows, PsGet is a way to easily add PowerShell modules to your prompt. Once you've got PsGet, the purpose of this post is to introduce you to PSReadLine. Not only does it give you nice syntax-highlighting for things like function building, it also shows me with the red > that I haven't closed the block. When you are editing a multi-line script, you can also now backup to other lines! If you're advanced, check out get-PSReadlineKeyHandler and not only look at what functions are bound to which hotkeys, BUT also check out all the functions that AREN'T bound. You have a lot of power for customization here! You can even set Emacs keybindings! Go check out https://github.com/lzybkr/PSReadLine on GitHub and give it a star! ConEmu - The Windows Terminal/Console/Prompt we've been waiting for? Ctrl+v pastes clipboard text to the console. Ctrl+z and Ctrl+y act as undo/redo for command line edits. Accidentally delete too many characters? Press Ctrl+z a few times. PageUp and PageDown work as you would expect. Great point, Keith! The support for Ctrl-A,C,Z,V is reason enough to take the PsReadline plunge! What about azure powershell? Do we have to install separately for azure powershell? @sridhar Yes, Azure PowerShell is just a regular PowerShell that imports Azure module on start. You can follow installation instruction from azure ps session, or just add `Import-Module Azure` to your $profile file. One of the most mind-boggling things about windows is that it STILL doesn't come with a decent console UI or text editor. 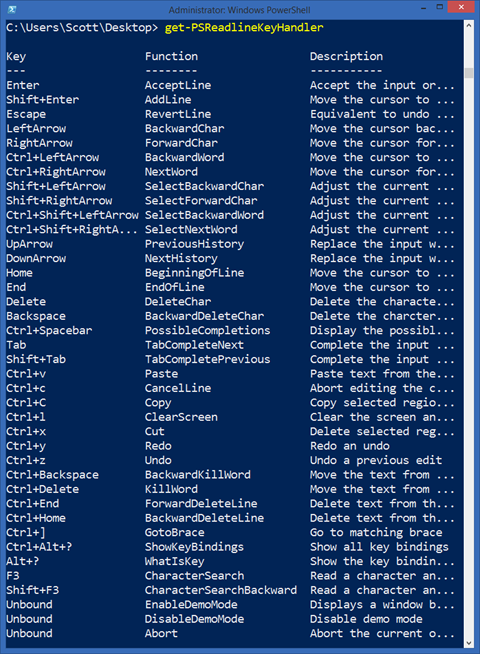 Copy and paste and keyboard shortcuts should not be functions in PowerShell modules. Cmd.exe should be fixed or replaced. @Peter: I'd say cmd.exe is unlikely to be "fixed", but Console2 is a great replacement! Yea, PSReadLine is really awesome. I also use ConsoleZ (https://github.com/cbucher/console) as a console host replacement. Hmm, after installing, I can't use autocomplete anymore. Everytime I hit tab I get the following exception. System.MethodAccessException: Attempt by method 'PSConsoleUtilities.PSConsoleReadLine.DoReplacementForCompletion(System.Management.Automation.CompletionResult, System.Management.Automation.CommandCompletion)' to access method 'System.Management.Automation.CommandCompletion.set_ReplacementLength(Int32)' failed. It's a great module. Thanks! It would be very good to have something like intellisense for command parameters! Not directly relevant, but I'd like to call out Cmder as a possible alternative to Console2. It's a shell over ConEmu, but is pretty off the shelf. Cool! I have this on my Apple II+ - it was called Global Program Line Editor! It'll be good to have similar functionality for PowerShell. hat are not valid ('RootModule'), then try to import the module again. Up graded ps to version 4 form 2 that worked. PSReadLine is great! But after installing it another molude, Posh-Git, stopped working properly. Particularly, auto-complete of git commands and branch names stopped working for me. Had the same issue than Tomij installing PsReadLine. PsGet help says that its commands are different than the ones in PowershellGet (WMF5) which I had already installed. Both modules provide an install-module command. Great addon, thankfully it didnot break anything else for me. My only gripe with this is that the highlighting (coloring) doesn't work as well on PowerShell ISE as it does on PowerShell.